Groupe Bluegrass US composé de David Grisman, Clarence White, Peter Rowan, Richard Greene et Bill Keith. 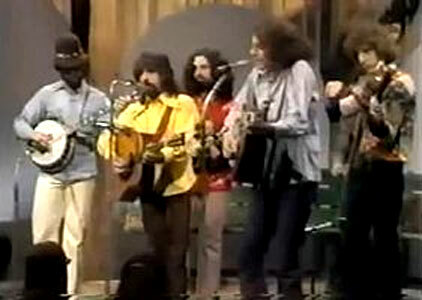 Muleskinner was perhaps the one and only bluegrass supergroup. Composed of David Grisman, Clarence White, Peter Rowan, Richard Greene, and Bill Keith, the group formed as a favor to a California public television station looking for someone to perform on a show with Bill Monroe's Bluegrass Boys. The choice of musicians was perfect for all had began their careers with bluegrass bands (Rowan, Greene, and Keith with Bill Monroe's band; Clarence White with the Kentucky Colonels; and Grisman with the New York Ramblers) and all had gone on to find success and respect in the industry (White with the Byrds; Grisman and Rowan with Earth Opera). Their appearance on the show was so successful that the band was offered a one album deal with Warner Brothers. The subsequent soundtrack to the TV special, an instant hit among bluegrass fans for its mastery of the idiom, has been re-issued several times throughout the ‘80s and ‘90s. With the exception of White, who died tragically in an auto accident, the members have reunited from time to time for one-off performances.